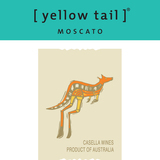 Yellow Tail Moscato displays lifted aromas of freshly crushed grapes, peach and passionfruit. This lightly frizzante wine tingles in your mouth with lively tropical fruit and underlying spiciness. Best served chilled as an apéritif or with summer salads.